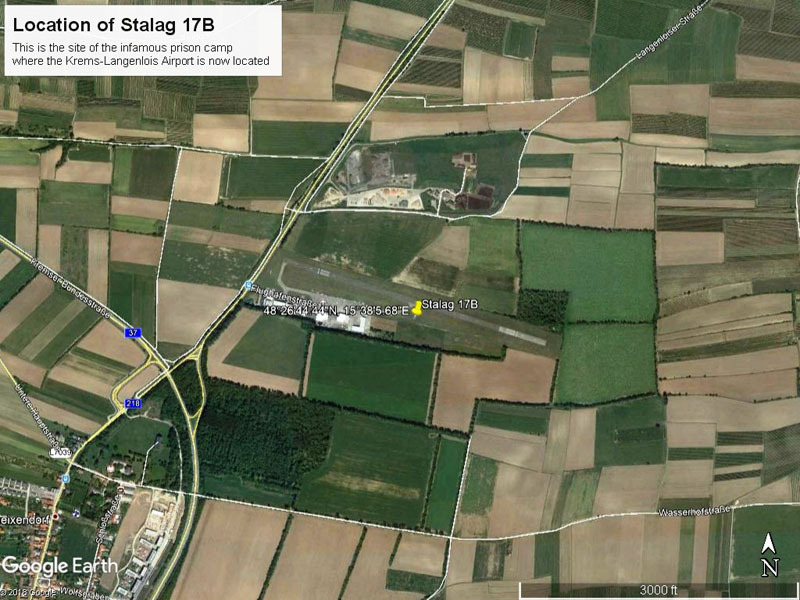 This is a view of Stalag 17B that you might not find anywhere else. 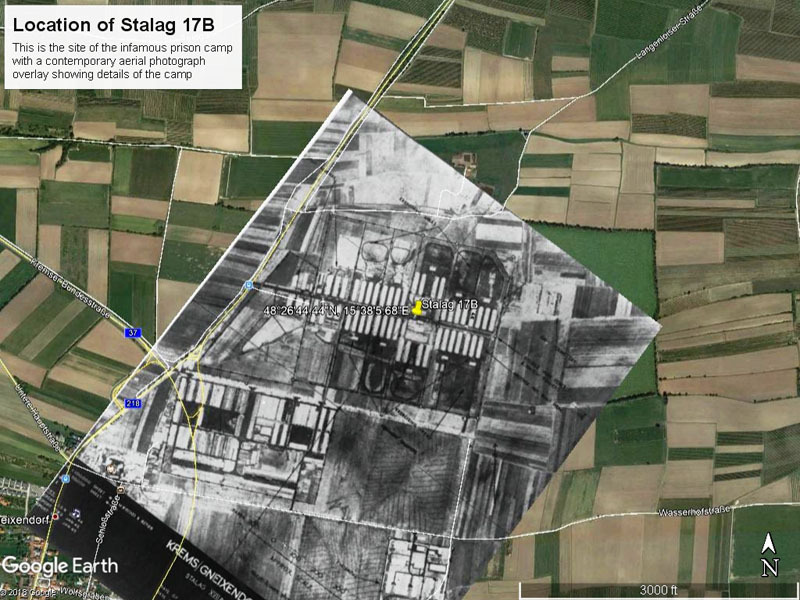 The aerial photograph on the Life in Stalag 17B page has been carefully resized, rotated, and positioned onto a Google Earth image. 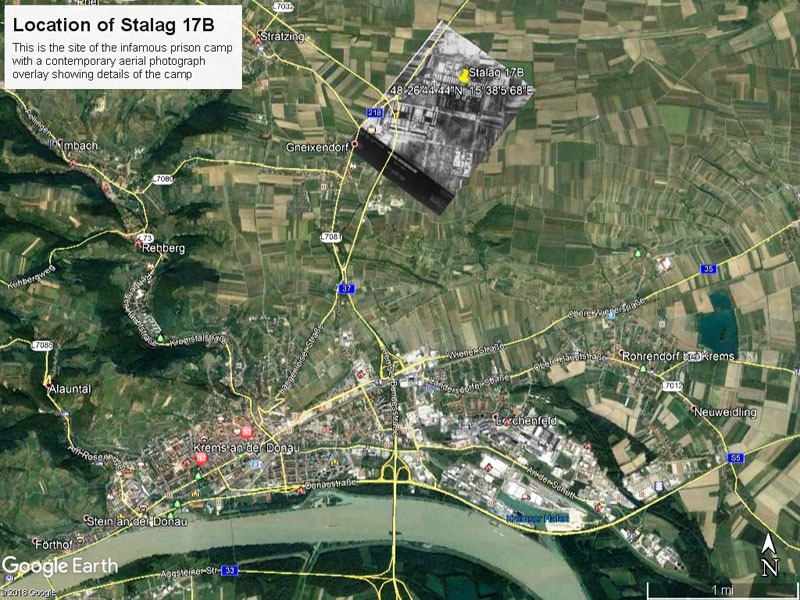 Stalag 17B has been overlaid at its exact location during WWII. A "pushpin" indicates the identical location (48°26'44.44"N, 15°38'5.68"E) in all of the images on this page. Compare the overlaid image with the no-overlay image and notice the agreement of landmarks such as paths, roads, intersections, and borders. You might want to take another look at the larger aerial photograph on the Life in Stalag 17B page to get a better appreciation of these details. The "pushpin" in the center of the barracks area is located in the center of an airfield today, the Krems-Langenlois Airport. Use this interactive image to clearly see the positioning of the overlay on the Google image. Appreciate and understand exactly the position of the old camp in relation to today's airfield and the surrounding fields. Move your mouse pointer over the image to see the overlay. Move your mouse pointer off of the image to remove the overlay.